So the ice and snow have melted, and temperatures have climbed to Louisiana “normal” in the 50’s and 60’s — even Limestone, Maine, which I wrote about in the first “Winter” blog a few weeks ago, will experience temps above freezing for an entire day before dropping to 3 degrees tonight. I wrote about the most severe winter of my life when I lived in Limestone, Maine during the 1950’s, and last week I experienced a deja vu when temps here dipped to 17 degrees. We in Teche country anticipate spring in March; however, Mainers won’t see fair weather until May or June. Today, rain is on the horizon. With the poet Shelley, we sigh and say, “O wind, if winter comes, can spring be far behind?” The inclement weather changes have caused an acceleration in cases of humans experiencing that phenomenon called “winter sadness,” and with respect to Maine lore, I’m wondering whatever happened to the machines Wilhelm Reich, a Maine crackpot? genius? invented to control the weather. When I was doing research for my novel, The Maine Event, (which I mentioned in Winter I.) I came upon an entry about this eccentric psychologist who studied for a while under Sigmund Freud. Reich migrated to Rangeley, Maine in 1948 and began carrying out experiments to prove his theory that “orgone” controlled the energy in the universe. He constructed these machines for harnessing the power of orgone, including a destructive cloudburst machine that he claimed could cause storms. He started selling his machines throughout the U.S., but the Interstate Commerce arrested and convicted him of fraud, and he died in a federal penitentiary. I didn’t get to visit Orgonon, the estate where Reich is buried, but it’s a tourist spot in Rangeley, Maine, and a museum there features Reich’s machines that supposedly created and controlled the weather. As I said earlier, he was either a crackpot or a genius, and he had access to fertile winter landscapes in the State as far north as Madawaska, not far from Limestone where I sojourned for nine months. Although there’s no permanent connection between Maine weather and Louisiana weather, I’ve mentioned in previous blogs the connection between Acadians who settled in the St. John Valley of Maine -- near where I lived the harshest winter of my life -- and Acadians here in southwest Louisiana. The Valley still has the highest concentration of French people in the U.S. and also has the highest percentage of French spoken in their homes. In the 18th and 19th centuries, these small homes once held extended families, sometimes as many as 30 people under one roof! Interestingly, those early Acadians in the St. John Valley settlements seldom saw a priest but they devotedly practiced the Catholic religion. A White Mass was often said by an elder,(sorta’ like a deacon) with the exception of the Eucharist. When priests began to enter the Valley to convert Indians, the Acadians benefited from their mission. In 1792, Catholics who were members of the Acadian colony actually traveled 100 miles to receive Communion from a priest on Easter Sunday. The churches they built were barn-like and were scattered throughout northern Maine. During my sojourn in Limestone, I remember that, rather than attend services at St. John’s Episcopal Church in Presque Isle, I attended Mass on Easter Sunday in a huge, drafty Roman Catholic church near Limestone. For those readers who wish to read more about the history and culture of the north woods of Maine, a book in America the Beautiful Series entitled Maine is an excellent reference and good winter reading. One of the responsibilities included in the challenge for an ordinand to the Diaconate in the Episcopal Church is:“To interpret to the Church the needs, concerns, and hopes of the world.” It’s a call to “communify,” a word that defines the ministry of The Rev. 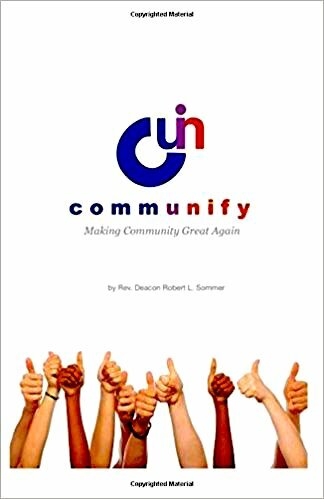 Deacon Robert Sommer, a deacon who has answered a call to work in a Latino community in Monterey County, California and documented his work in a new book entitled Communify recently published by Border Press. Sommer’s ministry focuses on a county that is #1 in the U.S. for a Latino population, with 58.3% Latinos living in Monterey County. Sommer targeted young adults in the Monterey Peninsula who need assistance in four major areas: Financial, Education, Skills Building, and Citizenship. He listened to, tested, encouraged, and provided options for young people to improve the quality of their lives while performing his diaconal ministry. His work includes young adults who were a first born generation in another country and first born in this country, and he has been actively engaged in conversations related to the future of these populations. In Communify he recounts the stories of 25 individuals involved in the “Communify” process. This process “addresses the individual, the community and the relationship between them…reconnecting the relationship between the individual and the collective…” and readers could interpret his work as changing a neighborhood into a brotherhood, no small project for someone like Deacon Sommer whose passion for his mission is evidenced throughout Communify. I found the stories of the 25 individuals highlighted in the book to be strong examples of “interpreting to the Church the needs, concerns, and hopes of the world.” Deacon Sommer identifies these stories numerically; for example, No. 5 was born n Da Nang, Vietnam and his father deserted the family when he was five years old. He works two jobs and lives with his mother while he attends classes to become a nurse. He isn’t eligible for DACA (Deferred Action for Childhood Arrivals) funds and has an objective of helping low-income families with healthcare. No. 12 is a young adult who was born in Mexico and came to the U.S. as a child. He graduated from Cal State Monterey Bay and has the desire to become a C.P.A. The young man wanted to share his passion for soccer with other youth in the area. He also needed help establishing a 501(c) 3 non-profit soccer league to provide funding for young people who wanted to play in a soccer league but could not participate because of cost. This young adult has the objectives to include more children in need and to reach further into the community. An arresting section on “Reconciliation” defines this word as the force behind the “Communify” process in which citizens move their focus outside of themselves, listening to another person’s words and within their context so that movement is made toward understanding what another person’s reality is and how he experiences the same world that surrounds both of them. It’s a process of bringing differences together and moving forward… “building relationship and accomplishing a mission together…” In the “Communify” process, people are called to be IN a community not BELONG TO it. Deacon Sommer identifies illness and wellness within communities and writes about the barriers that exclude populations that could make valuable contributions to the health of a community. He describes four types of isolation that are problematic in communities: emotional, social, spiritual, and iSolation (separation of a person from those around him through the use of electronics!). He pinpoints spiritual isolation as an alienation when a person is disconnected from his higher power; when people feel separated from God in the world and can no longer be in the presence of the sacred. This book is a meet document presented at a time when divisiveness is rampant in the U.S. and suggests a valuable process that allows citizens to live out the mission of reconciliation, transforming the world around them, beginning with the inclusion of young adults of different nationalities who want to become leaders in the U.S. society. Communify is a cogent document for ordained deacons, as well as for citizens who are being tested by the complexities of our present society. It’s an example of an ordained minister living the social Gospel. Hey la bas, or Eh la bas, or Hay la bas, whatever spelling of this Cajun exclamation you choose to use, reports are that the crawfish have buried deeper into the mud during the cold spell this month. There’s no exact season for the mudbugs, but usually, we begin to bring out the crawfish pots in January, and fishermen head for the waters of bayous, rivers, and the Gulf of Mexico to catch these crustaceans (however, 60 to 80 percent of today’s catch comes from crawfish ponds). Below freezing temps have resulted in diminished catches of smaller crawfish, but I’ve also read reports about the high quality of those that are caught. By the time we Mardi Gras in Acadiana, Clovis Crawfish should have emerged, fat and tasty, if the weather holds. Although I became allergic to shellfish in my fifties, I still read and appreciate recipes that feature this south Louisiana favorite. I especially like the (sound of) crawfish dishes prepared by two of Louisiana’s premier chefs: Marcelle Bienvenu and Stanley Dry. Marcelle is a native of St. Martinville, Louisiana and has cooked in Commander’s Palace in New Orleans, Brennan’s in Houston, in her own restaurant, Chez Marcelle, the restaurant at Oak Alley on the River Road, and has written several Who’s Your Mama, Are You Catholic, and Can You Make A Roux? cookbooks. Vol. 2 of this title includes an old-fashioned “Crawfish-Okra Gumbo” and “Fried Crawfish Tails,” and in the volume Marcelle edited for The Times-Picayune Creole Cookbook (sesquicentennial edition) she treats readers to “Crawfish Baked a la Creole.” The latter cookbook contains recipes tested by this chef with the assistance of Food Innovations, Inc. I met Marcelle one wintry day when she was the chef at Oak Alley and The Times-Picayune Creole Cookbook had just been launched, a copy of which lay on a counter in the Gift Shop at Oak Alley. As I thumbed through the cookbook, I realized the outstanding job she had done testing the recipes. “You should write your own cookbook,” I told her, and a few years later I was excited to read about her first Who’s Your Mama volume. Ingredients of Marcelle’s recipes include stories about family members centered around the table and photographs showing them at gatherings or outdoors enjoying the temperate Cajun climate. She’s an accomplished raconteuse as well as a premier chef. Stanley Dry’s Essential Seafood Cookbook is the second of Dry’s publications, and for crawfish lovers, the “Lagniappe” section contains a plethora of dishes featuring the mudbug: “Crawfish Omelet with Penne and Green Peas,” “Spicy Crawfish Spread” served on crackers, “Spicy Tofu with Crawfish,” and an all-time favorite in south Louisiana: “Mini Crawfish Pies.” Dry declares that “these days in Louisiana, crawfish show up in dishes from every imaginable cuisine” — thus, the piece de resistance, “Crawfish Tacos.” Dry writes the “Kitchen Gourmet” column for Louisiana Life Magazine and is a former senior editor of Food and Wine magazine. His articles about cooking, wine, restaurants, and travel have appeared in The New York Times, Food and Wine, and other magazines focused on good food and drink. Meanwhile, the mudbugs should be stirring soon as the weather has warmed. Crawfish marketers predict that the crustaceans should be a good size with a lot of meat and fat and ready for a tasty étouffée. Eh la bas, I envy those who can partake! Friends think I’m stretching the truth when I say that I lived in a place where the temps dipped to 52 degrees below zero in January 1954. This morning, people in that place — Limestone, Maine — are experiencing only thirteen below zero, but their winter won’t be over until May. I know because in May of the year I experienced the 52 below zero temp, I went outdoors wearing a short-sleeved shirt. Sub-zero weather lasted long enough for me to memorize most of the quatrains of the Rubaiyat and listen to recordings of Tchaikovsky’s music so much that I could hear the music reverberating in my mind even when the little 45 rpm record player wasn’t turned on. What became apparent to me is the same thing that became apparent to me while living in the desert province of Khuzestan in Iran — people who live in extreme climates had better develop a gracious plenty of indoor pursuits. Jewett lends a kind of romanticism to the stark winter I spent in Limestone; however, truth told, an old oil stove and an electric blanket were my only defenses against the wind that whistled under the eaves of a two-story farmhouse in which we lived. No heat in the bathroom; no heat in the bedroom; no garage to keep the block from breaking in an ailing Mercury station wagon; meatless meals and much beans-and-potatoes fare; no washer/dryer and lots of washing clothes in the bathtub of cold water. I have a long list of discomforts, but oddly enough, over forty years later, I began to write a novel entitled The Maine Event and last year, I had the novel recorded by a professional reader and put on Audible. As I listen to it, I find that the descriptions of the area and the primal forces of nature loom larger than the story, but, no matter, I enjoyed relating the memories of that winter of the 50’s. I lived near descendants of Acadians who settled in the St. John River Valley after being exiled from their homeland by the British. Their homeland Acadia had been renamed Nova Scotia by the British in 1710 which ended one hundred years of war between the British and French in North America. New France consisted of the colonies of Acadia, Louisiana, and Canada (Quebec). The St. John River had been a prime communication route between Port Royale, Acadia, a port from which some of my ancestors departed! I had no knowledge of this family association when I lived in Maine or perhaps I’d have been more interested in the history of Aroostook County. In my readings today about this history in Land of Promise edited by Anna Fields McGrath, I discovered an arresting sentence: “The Acadians remained dominant due to their very large families, economic control, and stubborn adherence to oral traditions and melancholic memories…” And why was I not surprised at that description of the Acadians?! Meanwhile, the temps have risen to 31 degrees in New Iberia, Louisiana and dropped to 9 degrees below zero in Limestone, Maine, and I am happy to be reminiscing rather than living in the harsh “Land of Promise” first inhabited by humans 11,000 years ago.